With this beautiful Deisy Ama Azul Mexican Talavera tile, you can decorate any space in your house, this typical Mexican ceramic clay tile will make your kitchen, backsplash, countertop, look gorgeous, giving a special touch that only Mexican traditional tiles can give. Mexican tiles can also be used in wall bathrooms, floor inserts, tabletops, you can created an atmosphere of rustic style using our Mexican traditional handmade tiles. 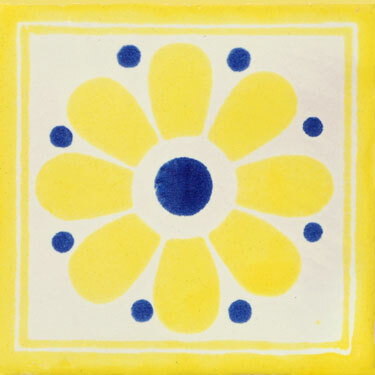 We offer a great variety of patterned Mexican ceramic tiles, when you adquire these Mexican ceramic tiles you are not only buying the tiles itself but culture and folklore.